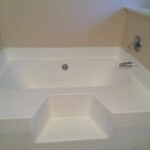 Looking for a cost effective way to update a bathroom with fiberglass tub/shower? After years, fiberglass can stain and become spotted. You can clean and scrub with all sorts of chemicals but nothing seems to help. 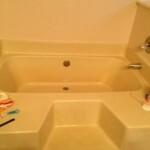 The situation with this bathroom (see pictures below) is that the tub and shower were looking pretty nasty. It also was a bone color which really needed to be updated to a white. Replacing the tub was not an option without putting out some big bucks. 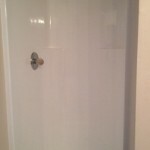 The bathroom doorway was not wide enough to fit a new tub through, so the door frame and part of the wall would have to be torn down and that pushes the cost way up. In researching I found a great cost effective alternative. 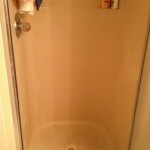 The estimates alone for replacing the fiberglass shower were $1100-$1700. The total for having both of these refinished was $848.00. Though there were quite a few companies out there that did this sort of thing, most only offered a 5 year warranty. This refinishing has a lifetime warranty. What do you think? If you have a neat cost effective home remodeling tip, let me know.